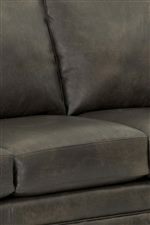 Covered in 100% cow hide this leather sofa is beautiful to look at and soft to sit on. Foam cushions offer great seating support. 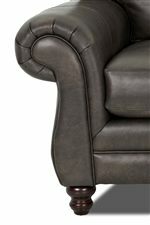 Panel rolled arms are comfortable to rest on and help balance curves with the straight lines in the sofa. Accent pillows add extra cushion and enhance the style of the sofa. 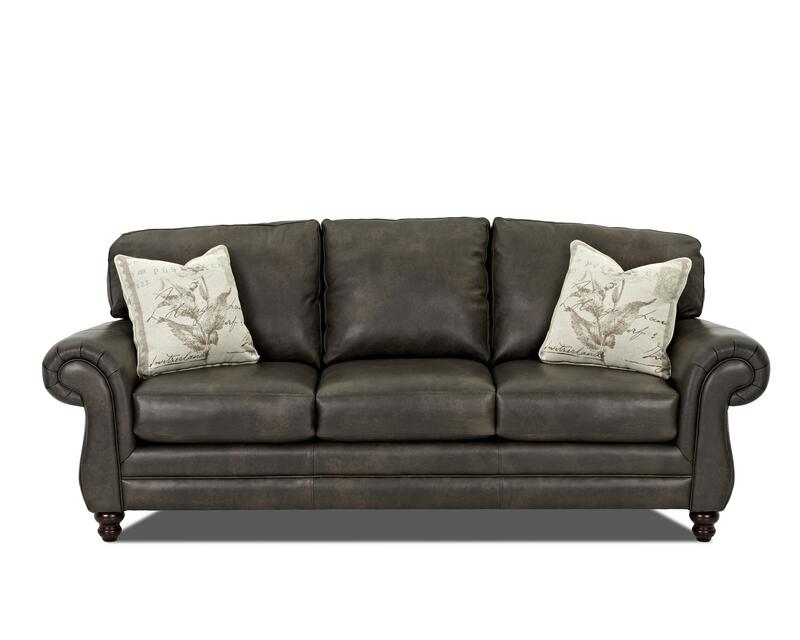 The Valiant Leather Sofa with Accent Pillows by Klaussner at Northeast Factory Direct in the Cleveland, Eastlake, Westlake, Mentor, Medina, Macedonia, Ohio area. Product availability may vary. Contact us for the most current availability on this product. Pillow Includes two 20" x 20" accent pillows. Seat Back Three foam back seat cushions. Seat Three foam seat cushions. Leg or Skirt Wood turned legs. Padding & Ergonomics Foam seat cushions. With its ties to timeless traditional style, this classic look will outlast all the fleeting trends for furniture that you can love longer. You can feel good about the furniture from this collection with its sturdy frames and seat support and its one-of-a-kind eco friendly seat cushions. This handsome style is available as a sofa, chair, loveseat, and ottoman and you can choose to give each piece a classic boost with option of nailhead trim on the arms and seat base. The Valiant collection is a great option if you are looking for Casual furniture in the Cleveland, Eastlake, Westlake, Mentor, Medina, Macedonia, Ohio area. 100% Cow Hide Adds A Great Look. Browse other items in the Valiant collection from Northeast Factory Direct in the Cleveland, Eastlake, Westlake, Mentor, Medina, Macedonia, Ohio area.